. . . a brilliant young medical student, trained at Guys Hospital in London, aced his apothecary examination (apothecaries were basic practitioners). 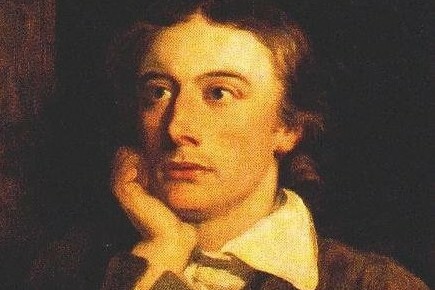 Notwithstanding this success, John Keats, who had already been writing poetry and had published one poem (a sonnet on solitude) in Leigh Hunt’s progressive weekly newspaper, The Examiner, back in May, decided that when he came of age (on October 31) he would cast his lot with poetry—more particularly, a brotherhood of poets, ranging from Homer in ancient Greece to the contemporaries whom he admired, and who fired his imagination: Lord Byron, William Wordsworth, Leigh Hunt. Hunt, The Examiner’s editor, already had his eye on Keats. It was in October 1816 that Keats wrote his first really great poem, spurred by a transformative event of reading a man’s vigorous epic. You can see Pope’s technical precision in these “heroic couplets.” This is a metrical unit, favored for heroic drama and tragedy, epic poetry, and poetic letters of civic and national import. The basic line–for example: “From mouth and nose the briny torrent ran”–is iambic pentameter. An “iamb” is an unstressed syllable followed by a stressed one (ironically, i–amb is not an iamb! ), five in pentameter (“five measures”). 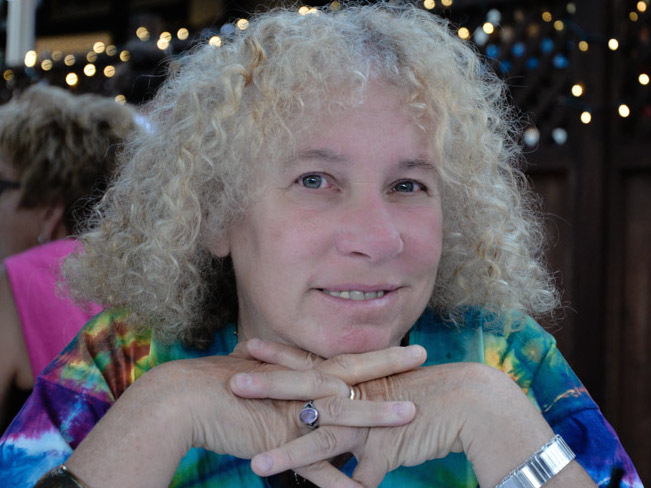 In a heroic couplet, the lines chime-rhyme (ran/man), and are carefully crafted so that the syntax pauses at metrically stressed rhyme-syllables. Pope allows himself one enjambment (syntax “striding over” the line’s end): “his knees no more / Perform’d their office.” Even here, you might feel a slight hovering pause at “no more”–as if inviting a thought of knees so destroyed by exhaustion that they are virtually “knees no more.” I like the effect, and imagine that Pope did, too. But he prefers a tidy couplet, including not only a coincidence of syntax and strong rhymes on stressed syllables, but also a “caesura”–a pause in the line after its second or third foot, often with punctuation (“He dropped his sinewy arms;”) or implied by rhythm or syntax: “And lost in lassitude (/) lay all the man,” where the adjectival phrase is completed, then the predicate and subject given. Pope finely tunes these effects, with care for continuities of sound across the line. I love not only the alliteration of the “l” in four words but also the chime of And in man to contour the line. Hearing Chapman, Keats comes to life as a poet. Chapman’s lines were still beating in his head as he paced the miles back home. He couldn’t sleep, so sat down to write out a sonnet, not about Homer, nor about Chapman, but about his excitement as a reader. Till I heard Chapman speak out loud, and bold. Keats pretty much got it in one shot (such is genius …! ), revising just a syllable, low to deep (6), for a better chord with demesne. You see him marking out his quatrains, thinking as poet. His sonnet is in the older, Italian form: two quatrains (rhymed abba abba), with a volta (a turn in the movement of thought). The sestet (“six” lines: cdcdcd) accumulate similes (poetic figures of comparison) for what it was like to read Chapman for the first time–or rather, to hear him “speak,” as if his very voice had been conjured that night. Keats ends his last two lines with those long dashes–as if to figure a wonder expanding into the blank, silent space beyond. 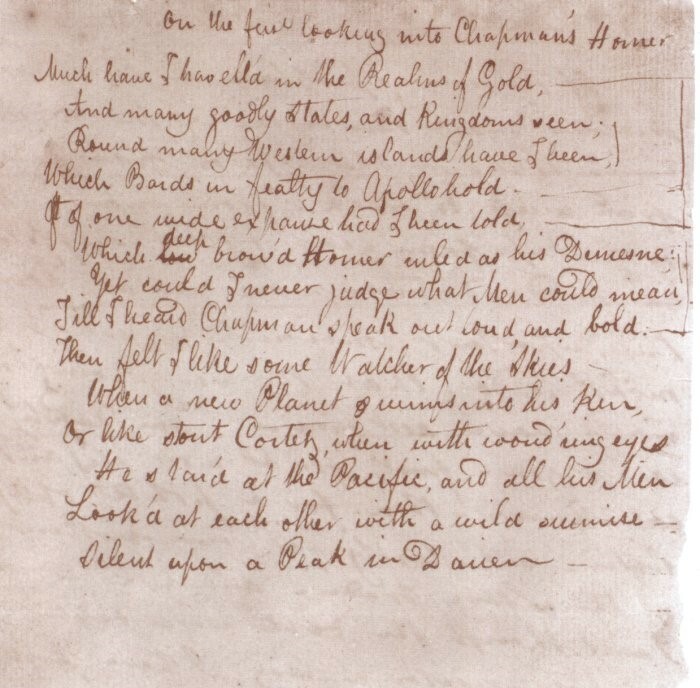 Its powerful conclusion of silently stunned awe notwithstanding, Keats’s sonnet rings its words from the very start: “Much have I travell’d in the Realms of Gold.” The four initial syllables strike the iambic code into dramatic stress, with chimes of have/trav- and vell’d/Gold. So too, at naming his poets, Keats hits the stresses: deep-brow’d Homer; I heard CHAPMAN speak out loud and bold. The sonnet’s formation deftly structures the drama: a survey of what has been “seen” (first quatrain)–known in literary history; a turn to Homer in Chapman’s poetry (second quatrain); a pivot at line 9 into two similes about revelatory visual discovery (sestet). The first comparison is to astronomer William Herschel finding a new plant in our solar system, Uranus in 1781, the next, to Chapman’s nearer historical company, Cortez arriving at the Pacific. Exploiting blank page-space, Keats sets the vast skies at the end of line 9 and the staring eyes at the end of line 11, as if the open page were a figurative field for skies and the gaze of eyes. I love the fleeting double-grammar allowed by 12 “He stared at the Pacific,—and all his men”: a pause of reading Pacific and the men in the conquistador’s stare. With line 13–“Looked at each other with a wild surmise”–Keats gives the master-grammar that makes them all lookers in a relay of rapture at the expanse before them. Marking surmise with a comma and then a dash into the page-space, Keats gives all his men (all three stressed) just a faint rhyme with Darien (a falling dactyl) for that quiet, yet still resonant, close. Taking another look at the sonnet when he readied it for publication in Poems (spring 1817), Keats decided that “Yet could I never judge what men could mean” was “bald, and too simply wondering” (said Clarke) and so he reworked it into a metaphor of elevated (and elevating) inspiration: “Yet did I never breathe its pure serene.” This involves an older sense of serene: an expanse of calm, clear sky. Keats may have been playing off of a line in Pope’s Iliad: “When not a Breath disturbs the deep Serene” (VIII.689). If so, he reverses Pope’s no-breath into inspiration, the in-breathing of reading Chapman (spiritus is Latin wind and spirit). Keats imagines (and imagines for us) what is must have been “like” to be Herschel looking into the night sky and discovering Uranus, or “like” Cortez, first looking into the Pacific. I want to pause over “Cortez” because this naming is often hooted at (or politely corrected) as a mistake, a sign of Keats’s spotty education. Tennyson’s smug advice in 1861, “History requires here Balbóa,” was endorsed for a long time, well into the 1990s even. But there is a logic for Cortez: Keats is imagining Cortez’s first view, not the first view by a European–or anyone’s “first look” at an object (planet, ocean, poem) already in existence. Tellingly, Keats left this reference to Cortez “uncorrected” in all his drafts and publications, and none of his friends thought it wrong. For Keats, Herschel and Cortez are not only figurative company in first astonishments, but also remembered from his exploratory readings as a schoolboy at Enfield Academy. There, he had had received as a prize John Bonnycastle’s Introduction to Astronomy (1787), with an account of Herschel’s discovery, and he read William Robertson’s History of America (1777) on the conquistadors in Panama. Keats’s sense of brotherhood extends to his friend and reading-partner Clarke, and more broadly, to a fraternity of modern poets, looking back to Chapman and forward into the unwritten serene of nineteenth-century possibility. Hunt’s introduction of Keats to readers of The Examiner with this sonnet was prescient: it’s now Keats’s most famous sonnet. 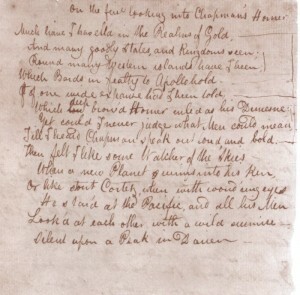 Noting that this young poet “has not yet published any things except in a newspaper” (that sonnet “To Solitude” back in May), Hunt mentions that he has seen (from Clarke) a manuscript of poems that “fairly surprised us with the truth of their ambition, and ardent grappling”—in effect, a kenning of Keats, with a hint of rhyming company in the way surprised echoes in Keats’s ocean-beholders’ all-absorbing surmise. Reading Chapman, Keats was reading himself, too, as a poet for whom looking is reading, and reading is looking.